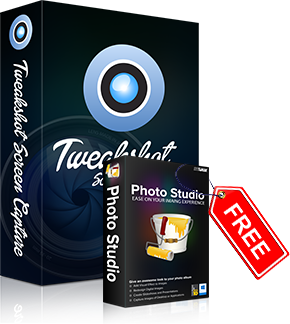 Purchase TweakShot the best tool to capture screen and record videos. Your information is secured using 2048-bit SSL encryption. Capture complete screenshot of current browsing page. Pick color from screen and images. This offer is valid if you buy TweakShot before Friday, April 26, 2019 - so don't miss out on this incredible opportunity. © Tweaking Technologies, 2019. All rights reserved. This offer is valid if you buy TweakShot before Friday, April 26, 2019 - so don't miss out on this incredible opportunity.It includes the most comprehensive set of utilities which will keep your PC running smooth, clean and error free. Why do I need TweakShot? TweakShot is a must have tool for those who want to capture active Windows screen, edit images, and get faster results. Not only this TweakShot even allows to capture entire screen, window, region, scrolling screen. Moreover, it makes designing easy by allowing user to pick and copy for images and screen. This is a one-year license and will be billed annually. Remember - 2 minutes of your time can save you from the hassle of capturing screenshot of active window, selected area. Moreover, TweakShot is an efficient image editor and color picker tool to help you design better.